If you are looking for a software to batch convert PDF to jpg images, you are in the right place. As you know, batch converting PDF to JPG can save you a lot of time, especially, you often convert batch PDF to JPG. So, a handy desktop software will be a good choice (because the online converts usually need you update and download the converted images, even need you register an account for login). Screenshot: result of converted batch PDF to JPG images. 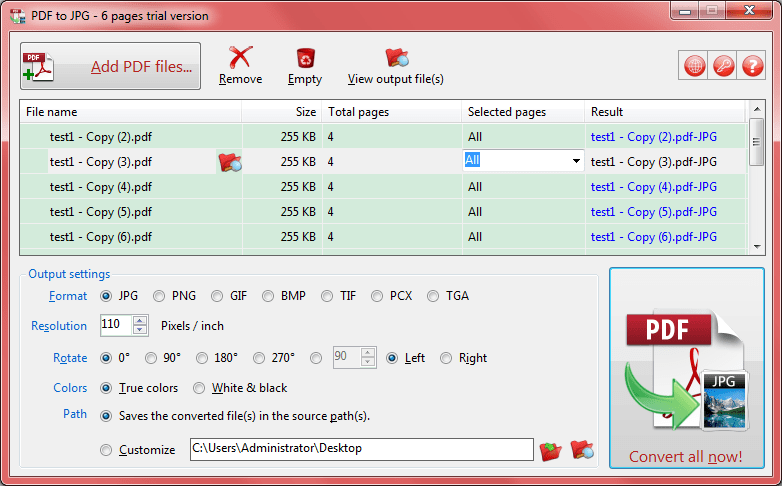 As above, this PDF to JPG batch converter has a listbox for accepting your batch PDF files. You can use <Add PDF files...> button to import them, or just drag-and-drop the PDFs from Windows Explorer to here. Both operations are easy to finish. And then simply click <Convert all now!> button or press <F5> to get the result. I introduce this one here, not only because it supports batch converting PDF to JPG, but also it is very fast, you can compare some other converters. More than converting batch PDF to JPG is, the current version is 9.0, that is, it is a very mature converter for this task. And it supports some settings for the output images (such as image format, resolution, rotate, output path and colors), some commands for the list box and output images, also, multi-language is supported! P.S. it also provides the Command Line Interface (CLI) for the programmers or expert PC users, just click the help button (top-right, first), and select "Command line interface" item, you will know all details about how to use the CLI.